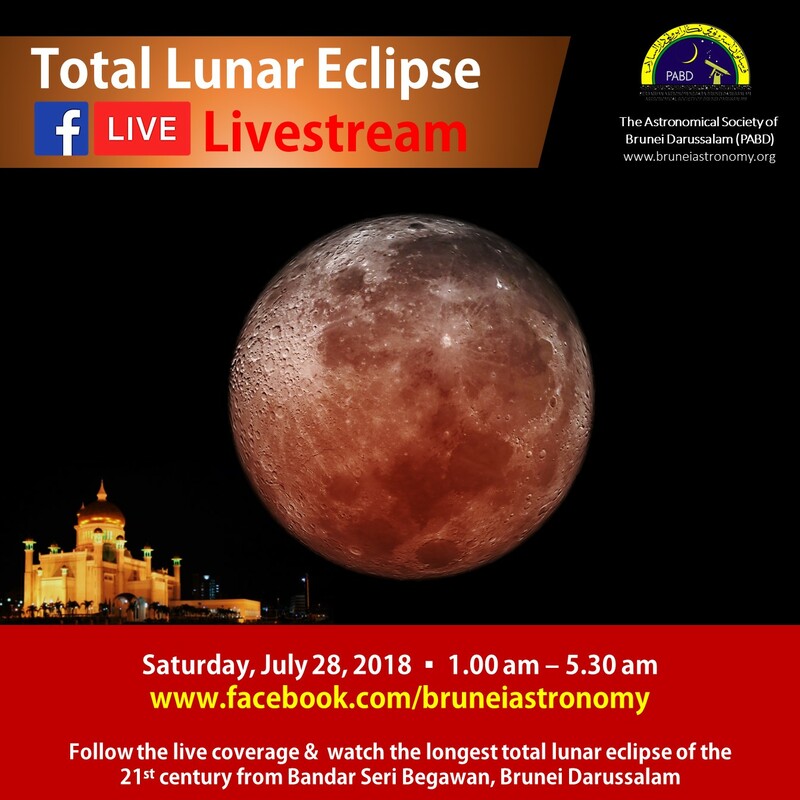 Bandar Seri Begawan – If the sky is clear, people in Brunei will have the chance to witness 2 very rare astronomical phenomenon on the same night – a planetary opposition and a moon eclipse – on 27th/28th July 2018. 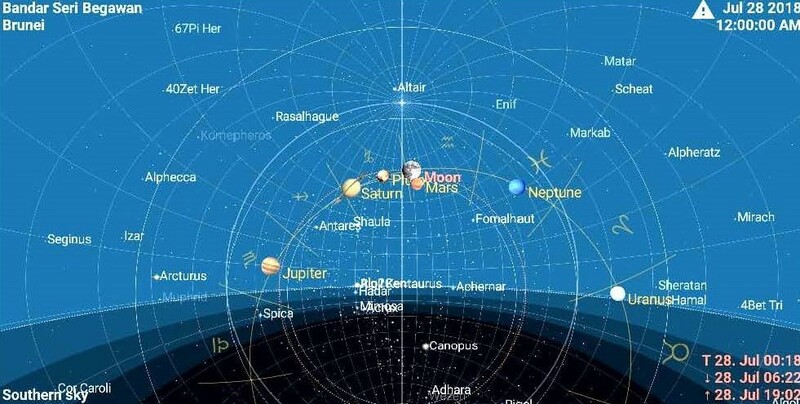 On July 27, at around 10 pm, the red planet Mars will be directly opposite to the sun and at the same time being at closest distance from the Earth at about 56 million kilometers. Mars will appear 10 times brighter than usual, at magnitude -2.8 on that night. We won’t have an opposition this favorable again until September 15, 2035. Stargazers should be able to see the planet appears as a very bright reddish “star” rising on the Eastern sky at around 8 pm. Stay late! The second cosmic highlight of the night will happen in the early hours of August 28, a total lunar eclipse or known as the blood moon starting at 1:14 am. During the eclipse, the Earth will be moving directly between the Sun and the Moon. The moon will be completely red for 1 hour 43 minutes during total phase from 3.30 am, the longest total lunar eclipse of the 21st Century. On average, the totality lasts approximately 1 hour to 1 hour and 30 minutes during moon eclipse. 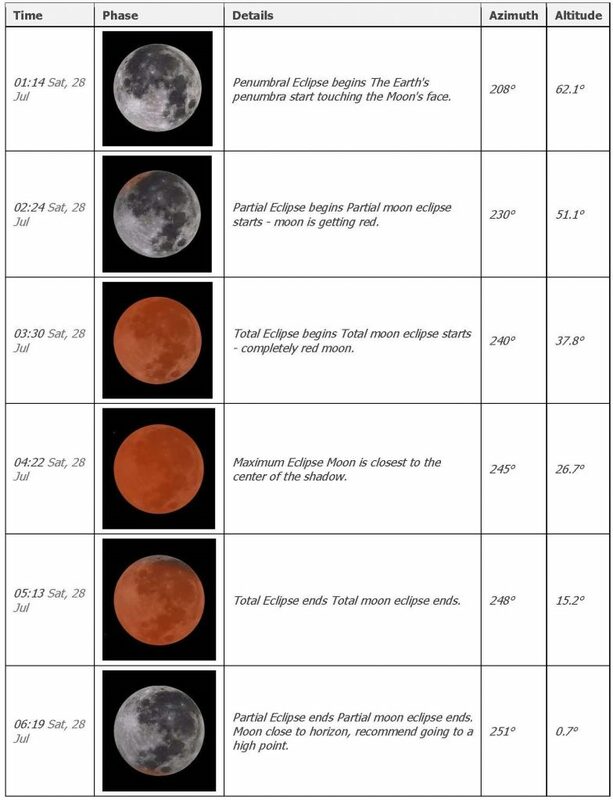 The next total lunar eclipse that will last that long will occur will occur not until 2123. How to view the Lunar Eclipse livestream? There will be a public observation of the phenomena at Taman Mahkota Jubli Emas, Bandar Seri Begawan from 7.00 pm (27th July) until 5.30 am (28th July). Telescopes will be set up for public viewing and astronomy talks will be conducted for free of charge at the venue. Members of public are invited to bring binoculars or telescope to enjoy viewing the lunar eclipse. 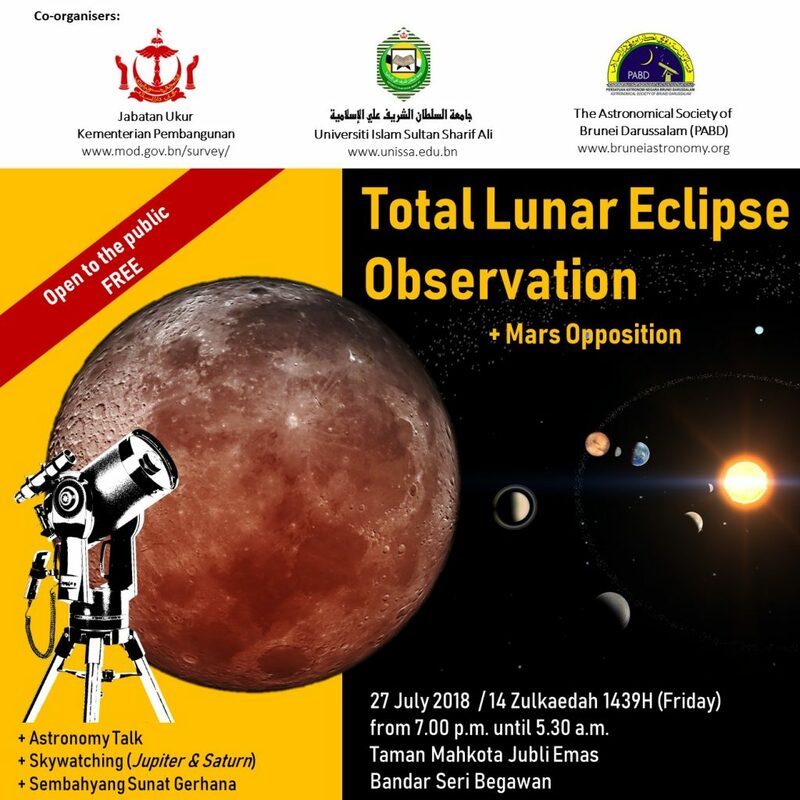 The event is co-organised by the Survey Department Ministry of Development, Universiti Islam Sultan Sharif Ali (UNISSA) and the Astronomical Society of Negara Brunei Darussalam (PABD). IF THE sky is clear, people in Brunei will have the chance to witness two very rare astronomical phenomena – a planetary opposition and a moon eclipse – tomorrow night, said General-Secretary of the Astronomical Society of Brunei Darussalam Hazarry bin Haji Ali Ahmad. On July 27 at around 10pm, the red planet Mars will be directly opposite to the Sun and at the same time being at closest distance from the Earth at about 56 million kilometres. 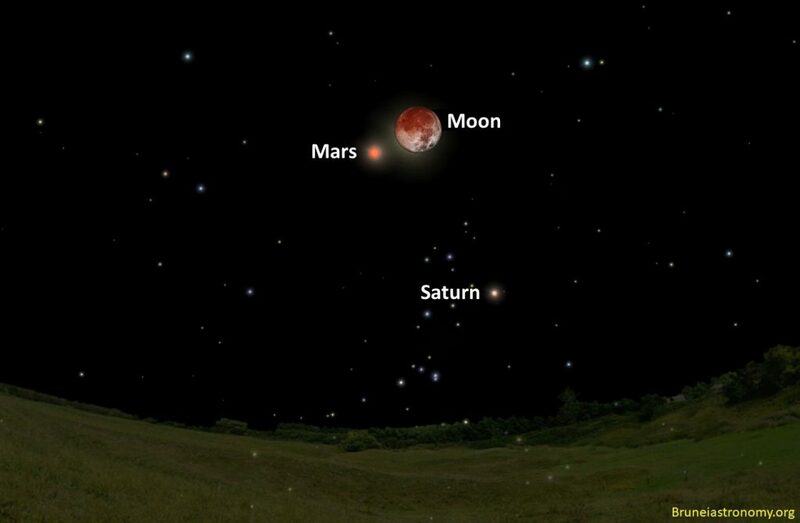 Mars will appear 10 times brighter than usual, at magnitude -2.8 on that night. We will not witness an opposition this favourable again until September 15, 2035. According to Hazarry, stargazers should be able to see the red planet appear as a very bright reddish “star” rising on the eastern sky at around 8pm from Brunei. “The second cosmic highlight of the night is a total lunar eclipse, known as the Blood Moon, in the early hours of Saturday. During the eclipse, the Earth will be moving directly between the Sun and the Moon. It will begin when the full moon enters the Earth’s shadow (Penumbra) at 1.14am on July 28. 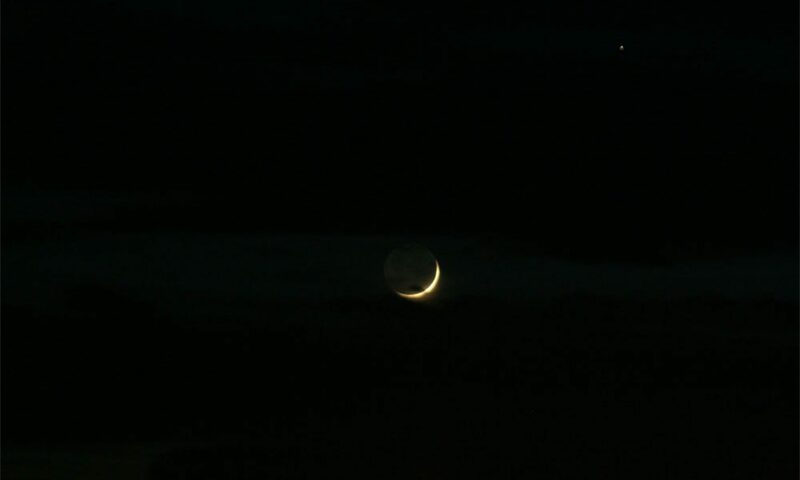 About an hour later, the partial phase will begin at 2.24am when the moon begins to be covered by the dark Earth’s shadow, the Umbra,” he said. Hazarry said the moon will be completely red for one hour 43 minutes during total phase from 3.30am, making the phenomenon the longest total lunar eclipse of the 21st Century. “Such long duration of total lunar eclipses had occurred on July 16, 2000 for a totality duration of one hour 46 minutes and another on June 15, 2011 for a totality duration of one hour 40 minutes. On average, the totality lasts approximately one hour to one hour and 30 minutes during moon eclipse. The next total lunar eclipse that will last that long will not occur until 2123,” he noted. It will be a spectacular night as the brilliant planet Mars will be near to the reddish-orange glow of the eclipsed moon, both visible with the naked eye. There will be a public observation of the phenomena at Taman Mahkota Jubli Emas, Bandar Seri Begawan from 7pm tomorrow until 5.30am. Telescopes will be set up for public viewing and astronomy talks will be conducted free of charge at the venue. Members of public are invited to bring binoculars or telescopes to enjoy viewing the lunar eclipse.